Best Alaska Campgrounds for RV's looks at which of Alaska's many campgrounds are considered best for camping in RV's including campers and trailers, fifth wheels and motor homes. When we first stated camping in Alaska there were few truly dedicated RV friendly campgrounds; boy have things changed. There are times when roughing it is just what a person is looking to do but equally there are the times when that electric light and microwave really makes life simpler. This page is dedicated to just those times, we hope you find it useful for planning your camping trips in Alaska. All of the campgrounds listed here offer at minimum 30 amp power, potable water and sewer hookups, WiFi and cable TV too. Clubhouses and swimming pools are so rare that those, while listed when available, are not figured into our considerations. Keep in mind that the RV Parks listed here are strictly our choices as the very best campgrounds in Alaska for RV's like the big Class "A" Luxury motorcoaches, larger Class "C" motor home and the longer fifth wheel trailers too. Chicken Gold Campground in Chicken Alaska; located 66 miles north of the Alaska Highway. 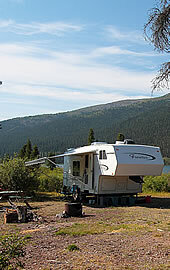 Chena River Campground is a state owned campground with services for RV's. Parks Highway RV Parks best suited for RV camping. Talkeetna RV Park may be a short drive off the Parks Highway but it's worth the trip in many ways. Portage Glacier RV Park is one of the newer RV parks in Alaska and is also strategically located in one of the most beautiful settings of all. Bear Creek RV Park in Seward Alaska offers a secluded setting for enjoying one of Alaska's favorite summer destinations. A Fisherman's RV Park in Homer Alaska is a small family owned business that works hard to make your stay as care free and enjoyable as possible. Large lawns between sites allows for a comfortable stay. Looking at the best places for renting an RV in Alaska we find plenty of choices available to you. From listings on craigslist to renting from a Good Sam's authorized dealer.